Home Local News & Views SF Bay Area Minister of Information JR is FREE! Join POCC Chairman Fred Hampton Jr. and Pam and Ramona Africa for a Power to the People Victory Celebration tonight, Monday, Feb. 22, 6:30 p.m., Black Dot Cafe, 1195 Pine St., West Oakland – YOU are invited! El-Hajj Malik El-Shabazz – Malcolm X – taught us, “Power in defense of freedom is greater than power in behalf of tyranny and oppression.” Though Malcolm was taken from us physically 45 years and a day ago, his spirit lives on … in the people, in YOU, who have kept the faith in a young freedom fighter. Today at the Alameda County Courthouse, made famous by the “Free Huey!” rallies held on the steps by the Black Panther Party, all charges were dismissed against POCC Minister of Information JR Valrey, producer of the film “Operation Small Axe” about the movement for justice for Oscar Grant and of Block Report Radio and associate editor of the SF Bay View newspaper. 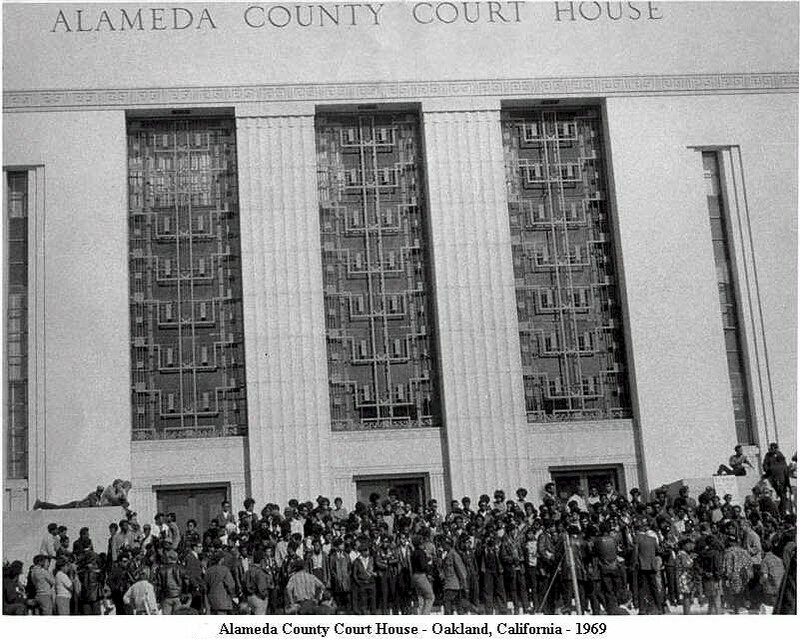 The crowd that packed the courtroom included Prisoners of Conscience Committee Fred Hampton Jr., Pam Africa of the Concerned Family and Friends of Mumia Abu-Jamal and Ramona Africa of the MOVE organization and a host of Bay Area activists. This victory belongs to the people, all of you who attended endless hearings over the past 13 months; donated to his legal defense fund and to send his team earlier this month to Haiti and to help him support his family as the camera he used to earn a living languished in the Oakland Police Department property room – it’s still there; recorded rap songs to keep the issues alive on the streets; and wrote and relayed a million messages through cyberspace. Special thanks and the greatest respect is due Marlon Monroe, the young Black lawyer who has provided JR with a brilliant defense. Minister of Information JR is the critic the Oakland PD most fears; for years he has covered their war against the Black community as other media cowered in silence. 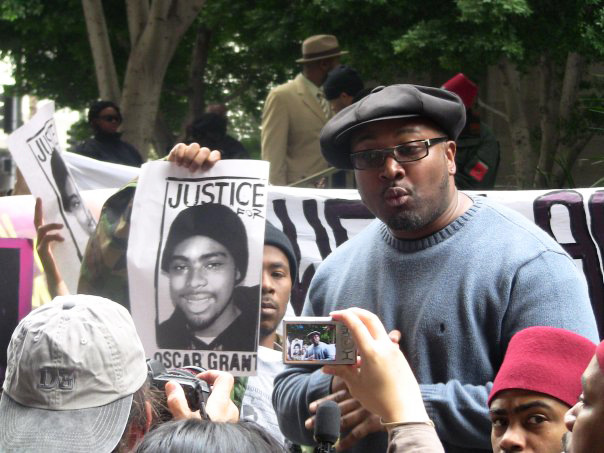 On Jan. 7, 2009, as JR was covering the first Oakland Rebellion following the New Year’s execution of Oscar Grant, the police grabbed the chance to put him away for a long time. He’d just left an impromptu press conference at the door of City Hall, where Oakland Mayor Ron Dellums sought refuge from reporters’ questions – the most pointed coming from JR.
As he walked away from City Hall reviewing the photos he’d just taken on his camera viewer, he was suddenly tackled by cops who nearly broke his leg. Two National Lawyers Guild legal observers, who happened to be nearby, saw that the charge the police pulled out of thin air – felony arson of a trash can – was ridiculous, as he had no matches, no lighter or any other means of setting anything on fire. Nevertheless, he was the only one of the dozens of journalists covering the rebellion who was arrested and one of only three of the 105 people arrested to be charged with a felony. Currently, only one other defendant, punk rock artist Holly Works, still faces charges. Her trial is set for March 1. Readers are urged to pack the courtroom so that her charges, too, will be dismissed. “Wednesday, just hours before JR was arrested, his Block Report interview with Donald Wiggins, a cousin of Oscar Grant, was broadcast on KPFA’s Hard Knock Radio,” I wrote shortly after JR’s arrest to give readers a taste of his everyday work. “As always, the interview reveals facts and perspectives never voiced to mainstream journalists, who are not trusted by the Black community because, unlike JR, they don’t come from the Black community. “‘He (Oscar) lay there (on the BART platform) for about 30 to 45 minutes,’ said Oscar’s cousin, describing the immediate aftermath of the shooting. ‘So it was really inevitable for him not to be revived at the hospital.’ ‘They let him stay on the platform of the BART for 30 to 45 minutes?’ asked JR. ‘Yes,’ responded Oscar’s cousin, ‘while they tried to confiscate phones and video and every other thing to cover it up.’” Listen to this and other riveting interviews on JR’s website, www.blockreportradio.com. When for a week following Oscar Grant’s execution and still that night of Jan. 7, Mayor Dellums refused to join the people’s demand that killer cop Johannes Mehserle be arrested and charged with murder or to make a statement of any kind, rage turned a rally into a rebellion. An explosion of young people of all races and classes confronting cops in riot gear nose to nose, jumping on a police car and breaking a few downtown store windows – yet hurting no one and stealing nothing – blared across TV screens around the country. Those remain goals we all need to unite and fight for. Our work is far from over. Killer copy Mehserle’s trial begins in Los Angeles June 7, and the crowds at the courthouse there must grow exponentially to ensure his conviction. JR is planning right now to return to Haiti as soon as possible with an even larger team to bring help and hope as our U.S. government deliberately starves and denies shelter and medical care to hundreds of thousands of Haitians in the rainy season that’s turning their world to inedible, disease-ridden mud. So to summon the courage to strengthen the struggle and mow down the obstacles in our way, let’s celebrate at the Black Dot tonight. Today the power of the people prevailed. Let’s keep the victories rolling. Free ‘em all! 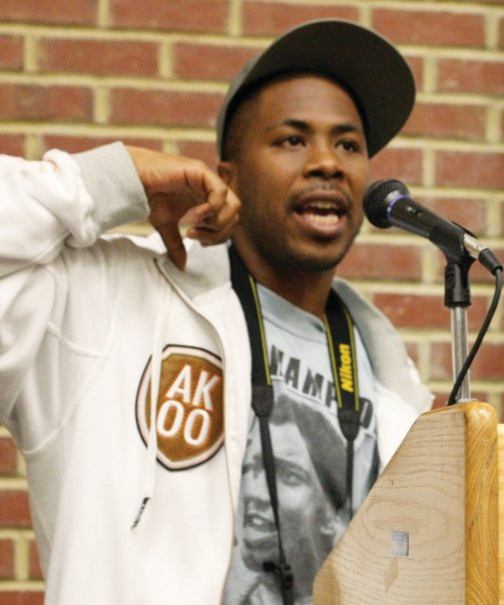 Prisoners of Conscience Committee Fred Hampton Jr.
YEAH! Good to have some good news. Mad love and support to JR for his leadership in the fight against oppression in our community. Wow, that’s not only a great news, but a helluva omen. Jr freed yesterday on my birthday! So glad u survived the usa injustice system! Welcome back though ur message never stopped, overjoyed for that! Paz y alma.